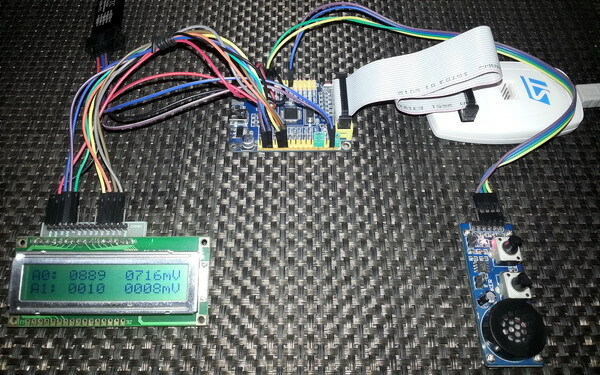 The more we code, the better picture we’ll get about the STM32’s ADC. At some point, you’ll feel that the codes are self-explanatory. For demo purposes I used a STM32F103C8T6 micro embedded in a cheap STM32 test board. 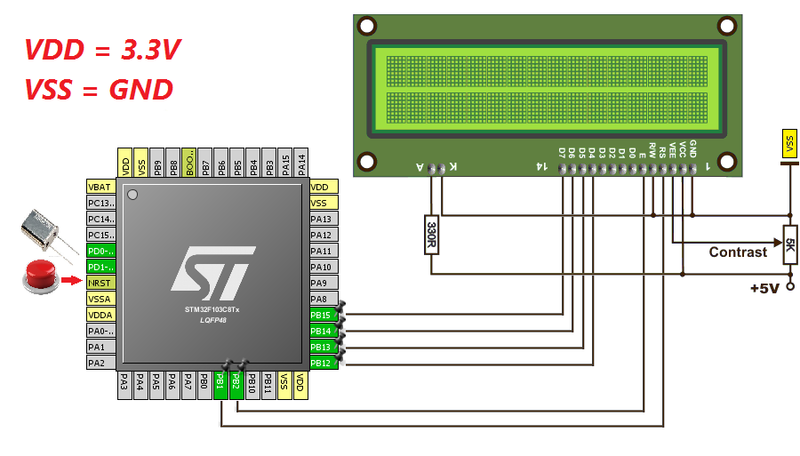 The basic connection looks like this: All of the stuffs above except the connections for the ADC inputs and the LCD exist in most development boards. ADC pins are typically attached with GPIOA port. MikroC IDE’s help section explains the purpose of these function. 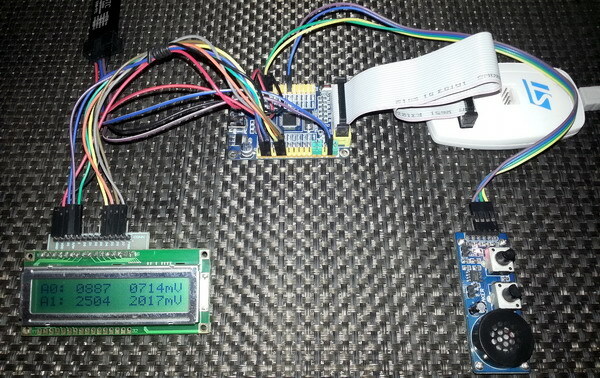 In this demo I just showed how to use MikroC’s built-in ADC library functions to initialize, get average ADC counts from two ADC channels and show both ADC counts and voltage levels of each channel on a LCD display. Just a piece of cake. Not much to explain. Demo video: https://www.youtube.com/watch?v=TwMTOLkWt-Q. 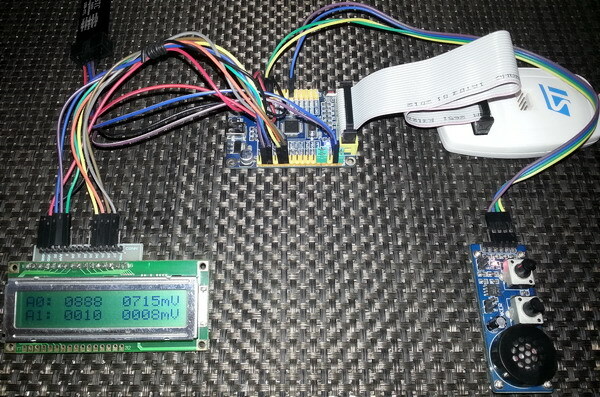 One of the cool feature of STM32 micros is the Analogue Watchdog (AWD) unit. In traditional micros, a programmer needs to add an if-else clause to monitor if the ADC readouts are within some predefined limits. There are, therefore, some coding and resource involved. 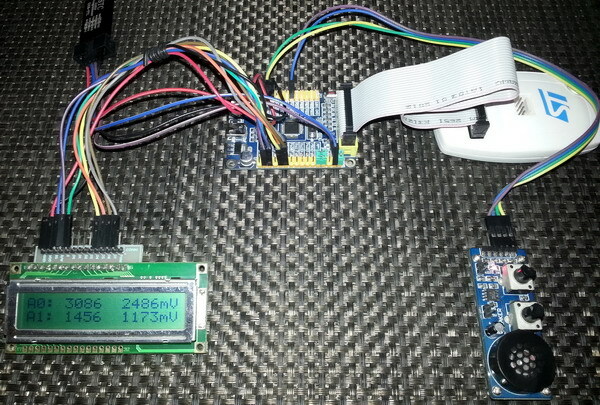 The AWD unit of STM32 micros can monitor if an ADC channel or all ADC channels are exceeding or within predefine upper and lower ADC count limits. In this way we can effectively set an analogue voltage level window for the ADC block. Thus this unit allows users to easily implement signal level monitors, zero-crossing detectors, analogue comparators and many other stuffs. Thanks to ST for hardcoding this useful feature with the ADC block. The upper and lower limit 12-bit values are stored in the High Threshold (HTR) and Lower Threshold (LTR) registers respectively. When the analogue input to be monitored is within these limits or inside guarded zone the AWD unit stays idle. When it is the other way around, the AWD wakes up. An AWD event interrupt can be generated if the AWD interrupt is enabled. Setting AWDSGL bit, AWDEN bit and JAWDEN bit in the ADC_CR1 select which channel types the AWD unit would monitor. The demo code for AWD is just same as the previous one but this time the AWD is also used to monitor all regular ADC channels. If the ADC readings exceed the guarded zone of 400 to 3695 ADC counts, the AWD fires. This mark starts to blink a LED connected to PC13, indicating an AWD event. Simply I need like this: Kindly help me. 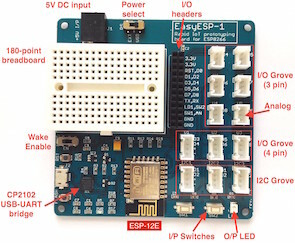 I need similar thing in STM32 but confused with too many options. Could you suggest the right way here ? Thanks for the great post. Do you have a version of your spl library for stm32f407? Great tutorial, thanks for the explanations! Is the DMA post already out? Would be very much appreciated. Thanks…. STM32 or any ARM family is not meant for beginners…. These families of complex micros are intended for high level works and so the learning curve is very steep…. It’s the best I could do rather than making tutorials with magic hexadecimal numbers and funny register names….